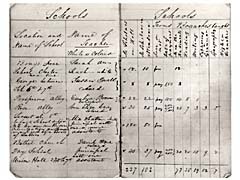 click image for close-up This document offers details about six of Philadelphia's privately operated schools for blacks established by 1837. Ten of the thirteen tuition-charging schools in operation at the time were taught by blacks, in addition to charity schools supported by white religious and abolitionist bodies. The city's first school for blacks was established in 1758 by the Bray Associates, an Anglican philanthropic society, despite opposition from white Philadelphians. Seven years prior, Anthony Benezet began offering informal instruction to free and enslaved blacks in his home at night. For the next seventy years, the education of black children was provided primarily through the support of white philanthropists such as the Quakers and the Pennsylvania Abolition Society, or in schools established by blacks themselves. Bethel Church began a Sunday school in 1795, Cyrus Bustill opened a school in his home in 1803, and Absalom Jones enlarged one school and opened another in 1804. Although an 1802 law called for subsidizing poor children in private schools, black children were excluded in practice. In 1818, the legislature established a comprehensive plan for educating poor children, but once again black children were virtually excluded; while several schools were built in white neighborhoods, cramped, rented rooms were the only public accommodations made for blacks until the erection of a black public school in 1829 and another in 1832. In the Appendix to an 1832 memorial to the Pennsylvania Legislature, black petitioners declared that "[w]hile we thankfully embrace the opportunity for schooling our children, which has been opened to us by public munificence and private benevolence, we are still desirous to do our part in the accomplishment of so desireable an object."